Assistance, reception at the airport and transfer to hotel. The group is taken over by Lt. Gen Gaur who takes you on a fascinating tour of New Delhi, starting by a visit to India Gate. This war memorial designed by Lutyens, commemorates more than 70,000 Indian soldiers who died in World War I, with their names engraved on the arch and foundations. Next, visit the Rashtrapati Bhavan, the official residence of the President of India. Thememorial combines western and eastern styles and is a masterpiece of symmetry, discipline, silhouette and harmony. 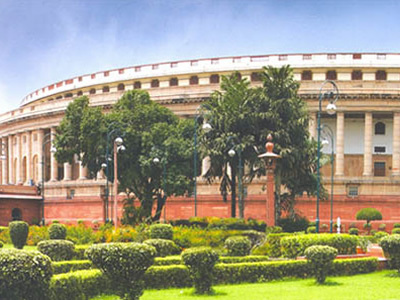 Northeast of the Viceroy's House is the Council House, now Sansad Bhawan. 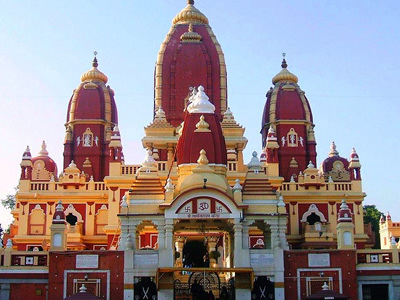 You are then taken to the Birla temple which is one of the most popular Hindu shrines in the city and one of Delhi's few striking examples of Hindu architecture. Dedicated to Lakshmi, the goddess of well-being, it is commonly referred to Orissan style with tall curved towers (sikharas) capped by large amalakas. Next follows a visit to the Qutab Minar considered to be the most glorious tower of victory in the world and the prototype of all minars (towers) in India. The inscriptions carved in kufi script tell that the tower was erected to cast the shadow of God over both east and west. The the Qutab Minar is 73m high and consists of five storeys. Next follows a visit to the Bahai temple, an architecturally remarkable building. 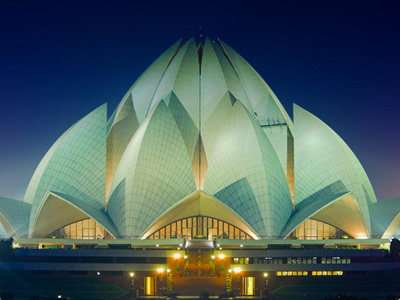 Constructed in 1980-81, the latest of seven Bahai temples in different parts of the world, it is built out of white marble and in the characteristic Bahai temple shape of a lotus flower. Internally, it creates a feeling of light and space. It is a simple design, brilliantly executed and very elegant in form. Drive back to your hotel for a continental buffet lunch at the coffee shop. Commence with the post lunch tour of the old city from the memorial ghats (a series of memorials to India's leaders), the most prominent one being that of Mahatma Gandhi at Raj Ghat. Visit the Red fort towering massively above the flat banks of the Yamuna on which it was built, the dominating impression of which is still immensely powerful. In front of the fort is a massive Maidan (open space) which has been used for political rallies ever since the time of the Independence movement. Next follows a visit to the Jama Masjid, the largest mosque in India and the last great architectural work of Shah Jahan, intended to dwarf all mosques that had gone before it. It also has the distinction of being one of the few mosques, either in India or elsewhere that was designed to produce a pleasing external effect. Drive back to the hotel in time for a brief rest and then gear up for the evening siesta of a Nepalese Food Festival specially created for you in the sprawling lawns of the hotel. Relish the traditional Nepalese food such as Tama (a dried bamboo shoot soup),momos (the Tibetan equivalent of ravioli), masko dal, dal bhat tarkari (comprising of lentil soup, rice and curried vegetables), sikarni (a sweet dessert made from curd ) and raksi (a local rice based brew of Nepal) India Gate, Delhi Tour. Morningboard the superfast Shatabadi Express train to Agra. One of the great Mughalcities of South Asia. 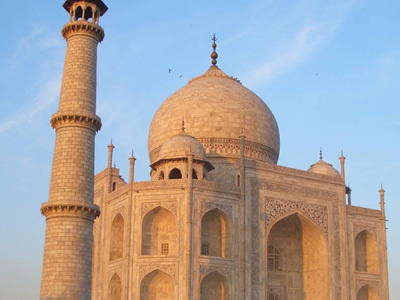 With minor interruptions, Agra alternated with Delhi as the capital of their empire.Check into the hotel and commence the city tour with the imposing Taj Mahal, built in memory of Shah Jehan's wife Mumtaz Mahal who died after 1 7 yr. of marriage. It is a monument which has drawn upon the creativity and skills of engineers and craftsmen from many parts of the world. It is said that besides great craftsmen and workers from India, artisans came from Central Asia and even Europe. The Taj stands on theYamuna river, and it is a monument that needs to be experienced and observed at different times of the day from far and near to get the feeling of sheer beauty that it evokes. Next,visit the Agra fort, started by emperor Akbar in 1565 and completed by his grandson Shah Jahan. It was conceived as a military structure when started but, by Shah Jahan's time it had become a palace. The fort is on the banks of the Yamuna river, and only one of its gates, the Amar Singh Gate, is open. There are a number of important buildings within the fort which are worth exploring. Later visit the Itmad-ud-Daulah's tomb built by Noor Jahan in memory of her father Ghias-ud-din Beg. Drive back to your hotel for a brief rest after which enjoy the delicacies of "Dum Pukht" cuisine in a sit down dinner at the hotel restaurant with the backdrop of the famous "Qawali" music involving group performers in traditional attire singing Urdu hymns an accordance with the fast beats of the tabla, harmonium and an array of other local musical instruments. Overnight at Agra. 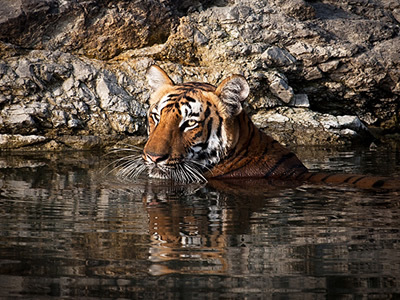 Drive to Corbett, India's first national park and one of its finest. 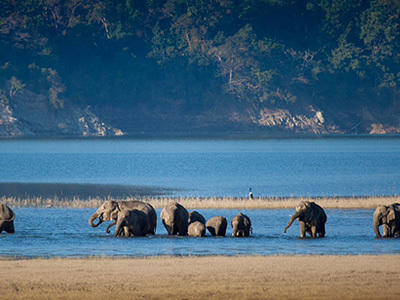 It is renowned not only for its rich and varied wildlife and birdlife but also for its scenic charm and magnificent sub-mountain and riverine views. 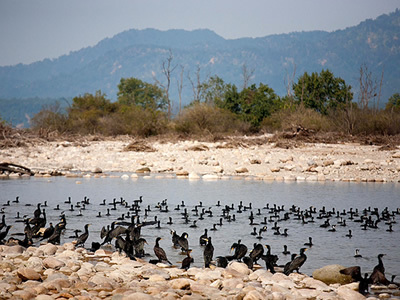 The park comprises the broad valley of the Ramganga river backing onto the forest covered slopes of the Himalayan foothills. Check into the deluxe Tiger Tops Lodge. In the evening enjoy the environs of this riverside resort. Later dinner is served in the open amidst the jungle atmosphere and around a splendid bon4ire. Overnight at the Lodge. Morning and evening visit the jungle on jeep and elephant back to view the varied flora, fauna and avifaura life in the evergreen forests of Corbett including the elusive tiger. Evening enjoy a tribal dance performance over a bon - fire while you relax with your "chhota pegs" and succulent bar- be- que specialities. Overnight stay in the Lodge. Drive to Rishikesh, the town which nestles around the Ganges as it swiftly runs through the last hills of the Himalayas. An. evening boat ride on the Ganges to observe the way of life in the Garhwal Himalayas. Evening beach party on,the banks of the Ganga complete with bon - fire and live band in attendance. Overnight at the picturesque Ganga Banks Resort (20 kms upstream from Rishikesh ) built blending into the landscape, in synthesis with the environment with modern comforts and country style hues that reflect the colours and tints of the wilderness beyond. 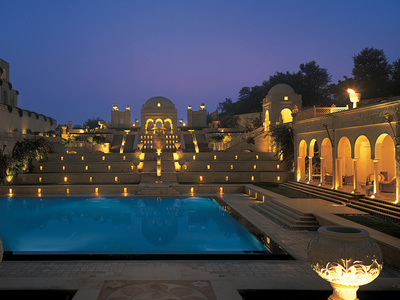 It is classified as India's most eco-friendly resort using solar heaters and other eco-friendly means. 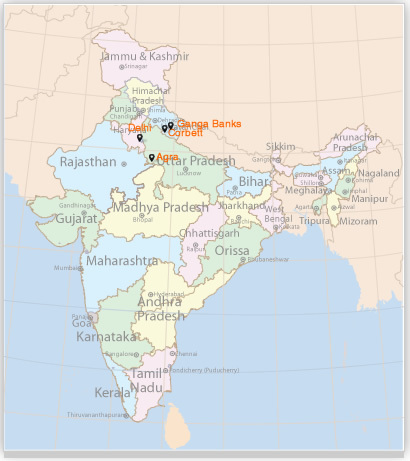 Overnight Ganga Banks. 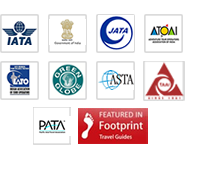 Full day tour of the ashrams, meditational centres and ancient temples. In the evening view sunset "aarti" at Haridwar. Gala theme dinner in which we take you back in time to a typical jungle hunting camp on the sprawling beach of the Ganges where you are welcomed by a tribal chieftain. The call of the wild and the sound of the jungle are complemented by folk singers and dancers. Torches and oil lamps lend a rustic charm to the tents pitched on the site. The food is cooked on pits over a camp4ire. An elaborate pyrotechnic display is mounted in front of the camp. A fire-cracker banner with the words SAVE WILDLIFE rounds off a magnificent evening. Overnight at Ganga Banks. Drive to Waterbanks for a gala farewell dinner. Evening at leisure for nature walks, birding, horse riding and boating etc. Evenings relish your exotic cocktails and a lakeside bar-be-que while a western band entertains you. Dancing to the beats of the music on a unique lakeside dance floor ends with an extravagant fireworks display to round off a spectacular evening. Later departure transfer in time to connect the flight to international destination. 1) Overnight at Mussourie, known as the Queen of the Hills, just 2 hrs away from the Ganga Banks. 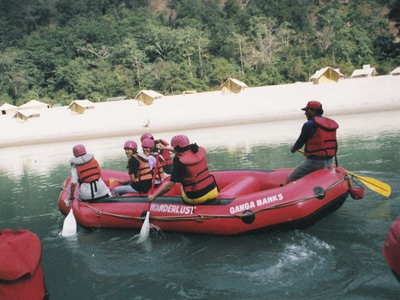 2) Ganga Banks, Haridwar Travel Guide.